Jonathan Head of BBC does disingenuous hit piece on Thai conflict. Exposing the BBC's lies - point by point. December 17, 2013 (Tony Cartalucci) - When the BBC isn't taking cash to fix the news, as exposed by the Independent, or deceiving viewers with fake footage posted in documentaries, or posting pictures from atrocities committed by the West in Iraq on news articles for Syria, it is meddling in every other corner of the world, manipulating public perception for the benefit of the corporate-financier interests it gladly shares the Chatham House's corporate membership with. In the case of Thailand, the collective interests represented by extralegal legislative organizations like Chatham House, are firmly behind the current regime headed by defacto dictator, billionaire Thaksin Shinawatra. In fact, along side the BBC upon the Chatham House corporate membership, sits Amsterdam & Partners - the lobbying firm of Robert Amsterdam who concurrently represents both Thaksin Shinawatra and his "red shirt" street mobs. Video: Grotesque propaganda attempts to skirt the dangerous personality cult of Thaksin Shinawatra built on political intimidation and a tendency toward extreme violence. The BBC is a notorious propaganda front representing not objective journalism, but the corporate-financier interests that sponsor it, and sit along side it on corporate-funded policy think tanks like the Chatham House. It is clear to see then, how hit pieces like the BBC's recent video report, "Thailand's 'red villages': The rural communities backing Shinawatra," come to be. BBC propagandist, Jonathan Head, has been lurking in Bangkok since the recent political crisis began - associating exclusively with the regime's supporters and mocking those who propose alternative views to the regime's narrative, which Head has been sent to defend. In the nearly 3 minute long clip, Head reports from the northeast province of Udon Thani, one of the few remaining strongholds of the regime. It was here on December 9, 2013's mass mobilization that a handful of peaceful anti-regime protesters were met by regime police and thugs wielding clubs in a blatant, and very "undemocratic" display of political intimidation. "The voices phoning in to the radio chat show are indignant. They've heard what the protesters have been saying - that up here people aren't smart enough to vote - that democracy doesn't work. There should be no distinction between high and low, between those with education and those who didn't finish school says this man. 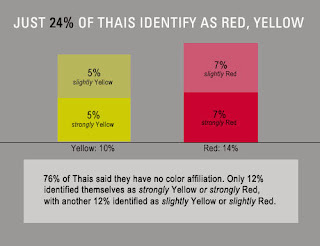 We're all Thais and we are all equal." The reality is not a class divide. 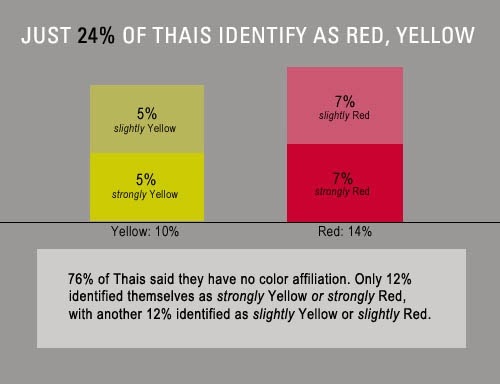 The number of actual Thais who identify themselves as "red" are only 7% with an additional 7% seeing themselves as leaning toward "red," this from an Asia Foundation report titled, "Survey Findings Challenge Notion of a Divided Thailand." The Thai Election Commission's final tally during the last general election showed that out of all eligible voters, only 35% voted for the current regime, and of those that actually bothered to show up and vote, only 48% voted the current regime to power. The current regime is in power not because of a class divide or even immense popularity, but because of a well-oiled political machine that has rigged the system, eroded the checks and balances, and has dug its despotism deep within Thailand's political landscape through fear, intimidation, and violence. The anti-regime protesters are not aimed at disenfranchising the rural poor - as many poor have joined the protests - rather it is to dig up the regime's political machine and remove it entirely from Thai politics. There were some armed elements among the red shirt movement then and they were confronting the army, not the police. Gun battles broke out and a full military operation. More than 90 died, most of them unarmed protesters. While Head admits "there were some armed elements among the red shirts," he fails to elaborate and instead gives viewers the impression that when the red shirts go to protest, they were met with unyielding brutality, in contrast to the "patience" current anti-regime protesters have been met with. Sawasdipol was formerly a Thai ranger and recruited many former rangers to be security guards for the UDD tented city in Bangkok. In one recent interview he declared that he had 300 armed men trained for ''close encounters'' and armed with M79 grenade launchers. "The red shirts' international spokesman, Sean Boonpracong, told Reuters elements of the army are with their movement. They are known as "watermelons" -- green on the outside but red in the middle -- and they include the shadowy, black-clad men with military weapons that were seen at the April 10th crackdown. "They are a secret unit within the army that disagrees with what's going on. Without them, the black clad men, there would have been a whole lot more deaths and injuries," he said." Jonathan Head's BBC hit piece shows clips of protesters with slingshots, cut with scenes of soldiers firing weapons - but a more appropriate clip would have been Al Jazeera's coverage of the April 10, 2010 violence where at 00:35, the militants described by HRW in their report Descent into Chaos can be seen holding AK47s and M16s. Video: At (00:35) militants holding both AK47s and M16s can be seen. These were just a few of the estimated 300 professional mercenaries brought in by Thaksin Shinawatra in his bid to violently seize back power in 2010 - glossed over by disingenuous propaganda by the likes of the BBC's Jonathan Head. Another clip from that same night the BBC's Jonathan Head might have included in his hit piece was the initial attack on riot troops with grenades and sniper fire. France 24 reported the first deaths were that of 7 soldiers killed in that grenade attack. Clearly, the 2010 protests served as an insidious cover for an armed insurrection that led to the deaths of over 90 people, the first 7 of which were soldiers, not protesters. Jonathan Head and the BBC's portrayal of these events are disingenuous at best, and show how the West is trying to retroactively rewrite history to suit their current agenda - propping up and perpetuating the Thaksin regime. 3. Glossing over "Red Villages"
Jonathan Head continues with his narrative, mentioning what are called "red villages:"
Khamsaen Chaithep's community is one of thousands that have declared themselves as "red villages," ready they say, to defend the party they voted for. " We will not accept another coup like in the old days. We will fight to keep the government we elected. And if the military tries a coup again, we will come out to die for democracy." Image: The BBC utterly glosses over the incredibly dangerous and unacceptable politically exclusive zones known as "red villages." Jonathan Head attempts to portray it as merely a popular movement to show support for the regime. Upon closer examination, it is nothing more than an attempt to intimidate the silent majority from speaking out against Thaksin Shianwatra and his embattled political machine. Declaring towns across the West as "Republican" or "BNP" would be met with howling indignation and immediate legal action. 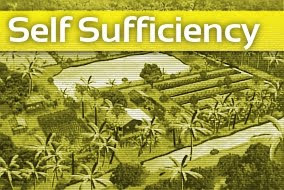 In Thailand, the West tacitly approves of such methods. What Head doesn't tell viewers is what an actual "red village" is and what the grave implications they have for the future of Thailand. A red village is a politically exclusive zone - the equivalent of declaring a street in the United States "a Republican Boulevard" or a shire in the UK as belonging to the British National Party. While the notion is laughable in the West because of the utter illegitimacy such a policy has, it is fully defended, even celebrated by the BBC and others in Thailand. The goal of "red villages" is political intimidation and the expansion of the bizarre personality cult of billionaire Thaksin Shinawatra - two goals that are clearly the antithesis of the so-called "democracy" the BBC claims these regime supporters are fighting for. Image: "I love you. รักมากคนนี้ (I love this man very much)" says devoted cultist and Udon Thani counciler Khamsaen Chaithep as she caresses an image of billionaire mass murderer Thaksin Shinawatra, the current defacto (and unelected) dictator of Thailand. The BBC pretends that the rest of Thailand's frustration with people like Khamsaen is irrational and derived from an elitist, condescending attitude. In reality, cult-like devotion to a billionaire mass murderer, the creation of politically exclusive "red villages," and a tendency toward extreme violence are the warning signs of despotism, dictatorship, and the ingredients for civil war and genocide. Aversion then, toward the regime's supporters, is in fact, quite rational indeed. The man they still love, Thaksin Shinawatra, is a man the other side detests, and fears. 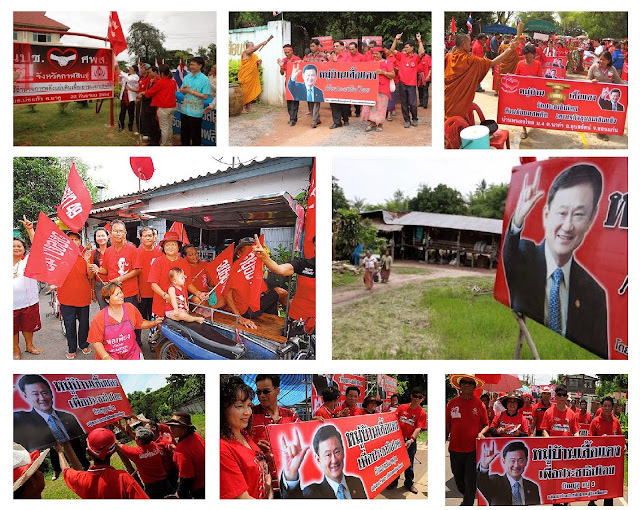 The BBC's hit piece attempts to frame a narrative of a down trodden rural poor simply fighting to have their voice heard and their support for Thaksin Shinawatra (who is not even the prime minister of Thailand, his sister Yingluck Shinawatra is) recognized. Head's concluding comment, "Thaksin Shinawatra is a man the other side detests and fears," deserves to be qualified - and would have been by the BBC were it an objective news organization and not merely a propaganda front masquerading as one. It is very clear to see why Thais have amassed in the streets calling for the complete "uprooting" of the Thaksin regime. From human rights, to freedom of the press, to the immense corruption, incompetence, and wrecking ball abandon exhibited by the regime, its removal is a matter of survival for Thailand. 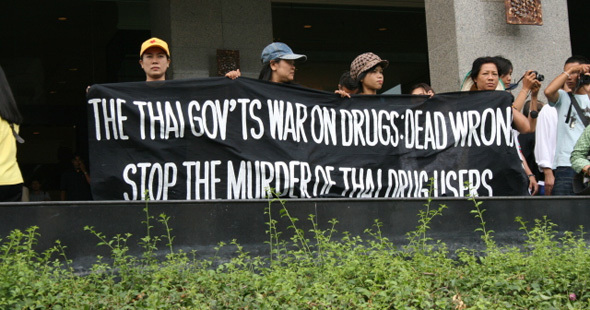 It is not that Thaksin Shinwatra's supporters are simply ignoring these crimes against humanity, it is that they are wildly popular among his support base. The voters who continuously return Thaksin and his proxies to power time and time again despite his serial crimes against humanity, clearly do not grasp or care about basic concepts like "human rights," "trials," and the "presumption of innocence until proven guilty," yet for those who do, and who have raised their voices and taken to the streets recently against this regime, they are expected to simply "shut up," "sit down," and remain hostages to this mentality, ignorance, and dangerous cult-like devotion. It is clear the BBC has dropped the propaganda hammer on Thailand, and it, along with others, like Reuters, AP, CNN and all the other disingenuous discredited media fronts of the West, will continue to do so at an accelerated pace as anti-regime protesters continue to gain ground against the Wall Street-backed regime of Thaksin Shinawatra. The BBC pretends that the rest of Thailand's frustration with people like Udon Thani's Khamsaen is irrational and derived from an elitist, condescending attitude. In reality, cult-like devotion to a billionaire mass murderer, the creation of politically exclusive "red villages," and a tendency toward extreme violence are the warning signs of despotism, dictatorship, and the ingredients for civil war and genocide - not "democracy."